Get the party started with your very own De Lux Cosmopolitan Travel Cocktail Bar Set! You can now enjoy a hassle-free party life anywhere! Perfect for your trips, vacation, or just to spice up any occasion! Easy to carry during your travel or just have it at home. A standard bar set containing a complete set of two martini glasses, shaker, tong, strainer, jigger, olive picks, napkins and stirrer! 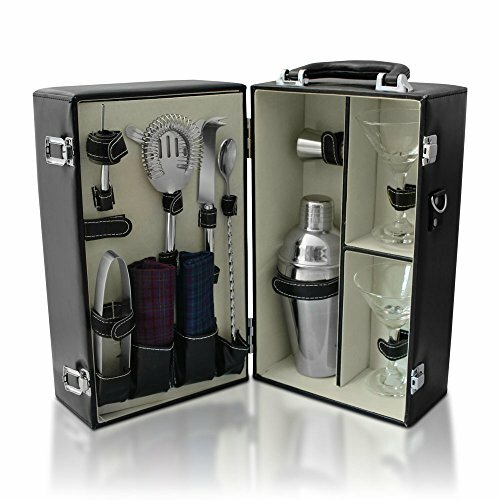 In a premium leatherette cocktail case with insulated velvety interior with attached separator board. Keep all the cocktail bar set items safely secured in place and with an insulated compartment to carry two standard size spirit bottles. Take it anywhere with its sturdy, convenient, adjustable and detachable strap and suitcase-style handle to provide comfort and easy transport. CONVENIENT AND PORTABLE - With a convenient, adjustable, and detachable strap with a handle in a suitcase-style to give you comfort and easily transport it anywhere! PREMIUM AND STURDY QUALITY - A high quality leatherette cocktail case made from premium quality materials with velvet interior and attached separator board. CONTAINS NUMEROUS ITEMS - Comes with your standard bar set which includes your very own martini glasses, shaker, tong, strainer, jigger, olive picks, napkins and stirrer in an insulated velvet interior. FUNCTIONAL COMPARTMENTS - Can safely keep all bar tools and martini glasses to avoid breaking. And with a especially design insulated compartments to carry two spirit bottles. EASY AND FUN - Contains everything you need to easily pour yourself a drink! A total party-on-the -go! Perfect for any occasion and an excellent gift too! If you have any questions about this product by De Lux Cosmopolitan, contact us by completing and submitting the form below. If you are looking for a specif part number, please include it with your message.